Apple roses have been doing cartwheels in my head for months now. They’re not exactly what you might be thinking – they’re not flowers carved out of fruit. They are individual apple strudels with a puff pastry shell and slices of apple that look like rose petals. It’s not often that my husband talks about baked goods with me, for fear of the mere mention resulting in sweet things magically appearing before him. I aim to please and when he told me about Apple Roses made with ready-made puff pastry, I dropped everything and rushed to the kitchen. No one has to tell me twice to bake something. Any excuse will do. Saturday morning was nice and cool, with a gentle breeze, setting the scene to surprise Shawn & Daisy with cinnamon apples wrapped in flaky puff pastry warm out of the oven. I was feeling lazy, so Pepperidge Farm came to my rescue and breakfast was baking while we lounged around, sipping coffee. Pretty little bundles of apples that look like roses make such a big impression when they hit the table. Just wait til you taste them. 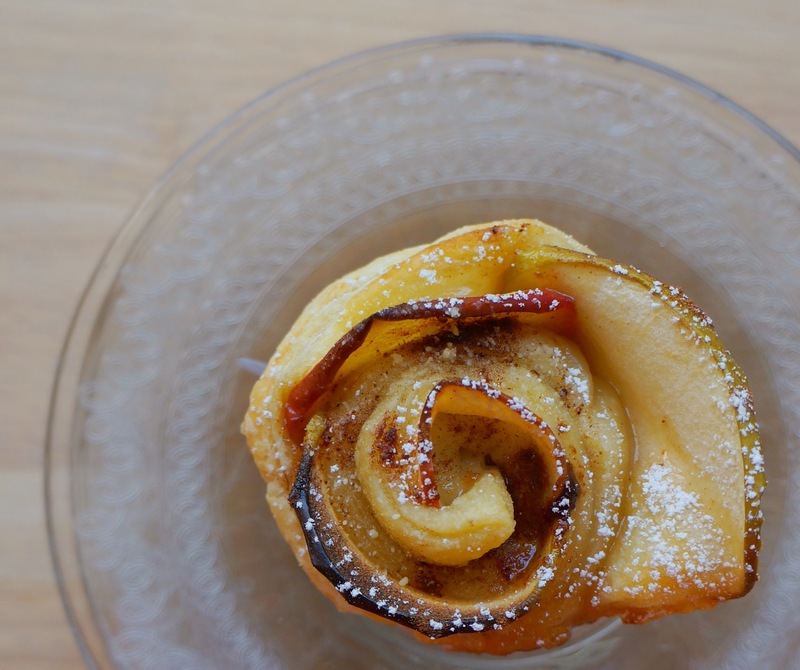 Apple Roses come together with very few ingredients and are quick to prepare. These little apple tarts made for a fancy breakfast treat that didn’t demand too much thinking on my part, which is good, because my mind doesn’t really wake up until after I’ve finished my coffee. I used a green and red apple for some contrast in color, but you can use whatever apple you like. Choose something firm and crisp, like a Granny Smith, Fuji, Pink Lady or Gala. They are a bit like apple strudel, but in a much more beautiful shape. The apricot jam goes great with the taste of the applies and acts as a glue to keep the apple slices in place against the puff pastry. Honey and maple syrup would be great substitutes if apricot isn’t your thing, but nothing compliments apples better than luscious, buttery homemade caramel sauce and you can easily make your own! Writing about food isn’t always easy. Not only does the recipe have to be easy to follow, but it should also deliver consistent results. Perhaps more importantly, the photos should be dangerously drool-worthy. The reader should want to taste the food, to make the food and be convinced s/he can and will try the recipe. Often, composing a well-written recipe and pairing it with gorgeous photos can be challenging, but Apple Roses turned out to be such a pleasure to make that I couldn’t wait to show them to you. They were beautiful to capture from every angle, like the supermodels in the world of baked goods. The photos speak for their beauty, but you have to make them to see how delicious these charming little parcels of apple-stuffed puff pastry are. Looks aren’t everything, but after a light dusting of powdered sugar, these Apple Roses are impossible to ignore. Just remember that it’s not nice to stare. See for yourself how easy it is to make these delightful little Apple Roses. What a great recipe! It looks pretty easy to make and it looks so impressive! I LOVE Pepperidge Farms puff pastry! How beautiful! I bet these are delicious! Oh! So beautiful and delicious! I’ve always wanted to try making them…now just might be the time! Thank you!! Hi coco, love the way your site looks, it’s beautiful. Also great video, you make apple roses look easy to prepare. Have a great week. Could these be any lovelier? And let’s face it, if you bring them to a party you’re going to impress everyone and isn’t that kind of part of why we bake, anyway? (or is that just me) Love them! Great treat for me and my family. Can’t wait to surprise them!